Grafitec canvases are screen printed in full colour. They give three options for floss DMC stranded cottons, DMC soft embroidery cottons and DMC tapestry wools. I chose a small canvas 'Autumn' and DMC stranded cottons. The instructions do say that the floss recommendations are only a guide and as the colour given for the sky was more lilac than sky blue, I changed it for another shade but used their suggestions for all the other colours used. 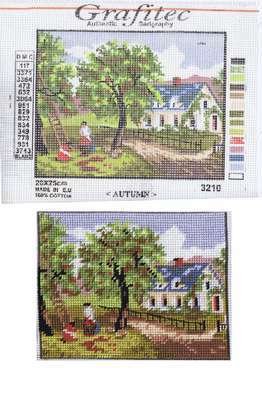 The design is intended to be worked completely in half cross stitch but since there is a fence in the picture, I felt that it would be difficult to reproduce in half cross stitch. So I decided to add backstitch after the half cross stitch was completed using three strands of cotton. Of course once the half cross stitch is finished then the details are almost lost so I had to improvise and add some backstitch as I went. Luckily, I was adding straight lines. It's possible that the problem I encountered only applied because it was a small canvas but I think even larger pictures would also have some small detail which could easily be lost. I also found it difficult to decide which colours to use on the stitches on the boundary between but I'm sure practiced needlepoint stitchers don't find this a problem. Perhaps I'm looking at it as a cross stitcher. The stranded cottons have a nice finish although light still shines through the canvas. Next I'm going to stitch another of the same canvas in wools to see what the differences are.